Home-Run Bat artwork from Super Smash Bros. Ultimate. 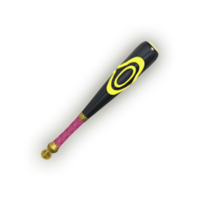 The Home-Run Bat (ホームランバット, Home Run Bat) is a battering item in all Super Smash Bros. games. It is best-known for its one-hit KO potential. 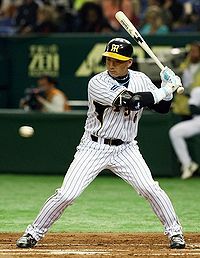 Player Tomoaki Kanemoto prepares to hit a baseball pitched at him. Wikipedia has an article on Baseball bat. The Home-Run Bat originates from the bat-and-ball sport baseball, which has a particularly strong following in Japan and is known as a national pastime of the United States. In the sport, the bat acts as the way that the player hits the baseball being tossed at them; the best batters are not only able to hit the ball, but also with sufficient power to send it to the fringes of the playing area, away from players of the other team. Should the batter hit with the correct timing and angling, the ball can be sent out of the playing area or even out of the park; these instances are referred to as home runs, as all players on the batter's team can finish a run in the playing area. Most home runs, however, also require almost perfect placement of the ball against the bat; in this case, a hit closer to the tip of the bat provides more power behind a swing, whereas one closer to the handle leads to a weaker hit. In Super Smash Bros., this is mirrored by how the bat is more powerful when hit with the tip, and how it sends opponents away at extreme velocities and trajectories; mirroring how home runs are sent over the walls of the playing field, the resulting angle of the opponents hit with the bat are also sent upward instead of a semi-spike trajectory. Adding to these references, players also tend to bring the bat slightly farther behind them just before hitting, as to put more power behind the swing; this is emulated in Brawl, where players wind-up for a time as though to get more power behind their swings. Ninten using his bat against an enemy in Mother. The SMAAAASH!! indicates that the attack is a critical hit. In addition to the real-life counterpart, another possible inspiration for the item is speculated to come from the Mother series. Ninten and Ness, the main protagonists in Mother and Earthbound, respectively, use bats as their main weapon throughout the game. As the game progresses, the player will find increasingly powerful bats. In a battle, there's a random chance (decided by the Guts stat in EarthBound) that the attack will be a critical hit (or "SMAAAASH!!" attack), which deals more damage than an ordinary attack. If these games influenced the Home-Run Bat's behavior, then it can be said that the one-hit KO smash attack comes from the critical hits. This theory is further backed up by the fact that Ness' forward smash in Super Smash Bros. and Melee makes a ping sound like the Home-Run Bat's. Also, the Mario franchise, being home to many spin-off franchises since Super Mario Kart was released, has had its moments with baseball, with the Mario Baseball series consisting of two very successful games, Mario Superstar Baseball and Mario Super Sluggers; however, they do not seem to have any connection to the home-run bat itself. Zero Suit Samus using the Bat against the Ice Climbers. Link and Mario demonstrate the unique animation for the Home-Run Bat in Brawl. While the Home-Run Bat functions like regular battering items, it has the unusual property of completely altering the character's forward smash. Upon performing a forward smash, the character winds up and performs a single, delayed swing that can potentially KO opponents in a single hit. The attack always takes a set amount of time and cannot be charged, making it the only such item to alter this mechanic in players. Super Smash Bros. 64 has the fastest wind-up time. Along with its signature forward smash, the Home-Run Bat is also powerful when swung or thrown normally, being capable of KOing relatively early, especially in regards to its dash attack and smash throws. In Smash 64 and Melee, characters use their standard item swinging animation; however, from Brawl onward the animation was changed so that all characters wind up like actual baseball players. This altered wind-up causes the attack to be considerably slower than in previous games. In SSB4, the smash attack swing is comparably faster than in Brawl. In addition, a smash attack swing gives the user super armor at the very moment he or she swings the bat, and is capable of instantly breaking shields. These factors make it more dangerous to interrupt head-on when compared to previous games. The Home-Run Bat deals most of its damage at the tip of the bat instead of the center; the extreme knockback in both of these hitboxes, however, makes this point relatively moot against other players (though very important in the Home-Run Contest, where the former is commonly known as a "tipper"). The Bat is also powerful when thrown, dealing around 20% damage and high knockback. Starting in SSB4, the bat swing can also reflect projectiles, similar to the one used by Ness in his forward smash. The bat is also an item in Smash Tour: when its trophy is selected, the user starts the battle wielding a Home-Run Bat. In the Home-Run Contest, the player is given a Home-Run Bat to assist in sending the Sandbag as far away from the starting platform as possible within the time limit. While acting as the primary way to hit the Sandbag for the large majority of characters, some attacks can potentially send it farther than the actual weapon at certain high enough damages, including throwing the Home-Run Bat itself. The Home-Run Bat trophy in Melee. Smash an enemy with this slugger, and you'll send them flying out of sight; hence the name Home-Run Bat. The sound of the bat being swung immediately strikes fear into the hearts of opponents and can turn the tide of a battle. It's slightly risky to use, though; it has a very limited range, and it takes a little time to wind up for your swing. The Home-Run Bat trophy in Brawl. A battering item. Smash a foe with this and be rewarded with the distinctive "KREEEEENG!" sound of a home run as your foe goes flying. The sound echoes with what's surely the timbre of supreme bliss. For the character being hit, though, it must be one of the scariest sounds ever. But it's not easy to use-- it swings slowly and has a limited range. High risk, high reward. The Home-Run Bat trophy in SSB4 (3DS). The Home-Run Bat trophy in SSB4 (Wii U). Combine this black bat with a forward smash to try for a home run, using an opponent as the ball! Unfortunately, the reach on the bat is not all that impressive, so it takes some real skill to line up a hit. Keep your chin up, though-the loud "KREEENG" of a hit makes it all worthwhile. Batter up! (That's what they say right?) Get a home run by side-smashing an enemy right off the stage! Enemies are more difficult to send flying than baseballs, though - or so we're told - and this bat doesn't exactly have a long reach, so if you want to hear the satisfying sound of your foe flying off-screen, you'll have to work for it! Home-Run Bat artwork for SSB. Home-Run Bat artwork from Brawl. Home-Run Bat render from Smash 4. The Home-Run Bat's in-game appearance in SSB. Samus KOs Fox using the bat. Mewtwo using the Home-Run bat in Melee. Mario using the bat in the Home-Run Contest in Melee. Marth successfully KOing Falco with the bat in Melee. A successful Home-Run Bat smash in Brawl. Toon Link using the Home-Run Bat on Donkey Kong. Donkey Kong flying off stage after being struck with the new bat. Mii Brawler holding the bat in the Home-Run Contest in Super Smash Bros. for Nintendo 3DS. Zero Suit Samus is about to send Sandbag flying with the Home-Run Bat. Fittingly, the ornate redesign of the Home-Run Bat in Smash 4 matches the colors of the "Deadly Blow" effect that appears when a character is hit by an attack strong enough to immediately KO. Bayonetta usually speaks when using a standard smash attack and grunts when using a smash attack with a battering item (such as the Beam Sword), but she speaks when using a Home-Run Bat smash attack. This page was last edited on February 17, 2019, at 23:11.